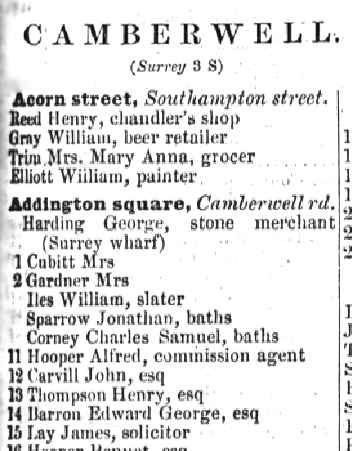 Addington Square was built between 1810 and 1850, when the area was still mostly fields and market gardens, and became home to the well-to-do escaping densely populated central London. It had a canal and two swimming baths by 1840. 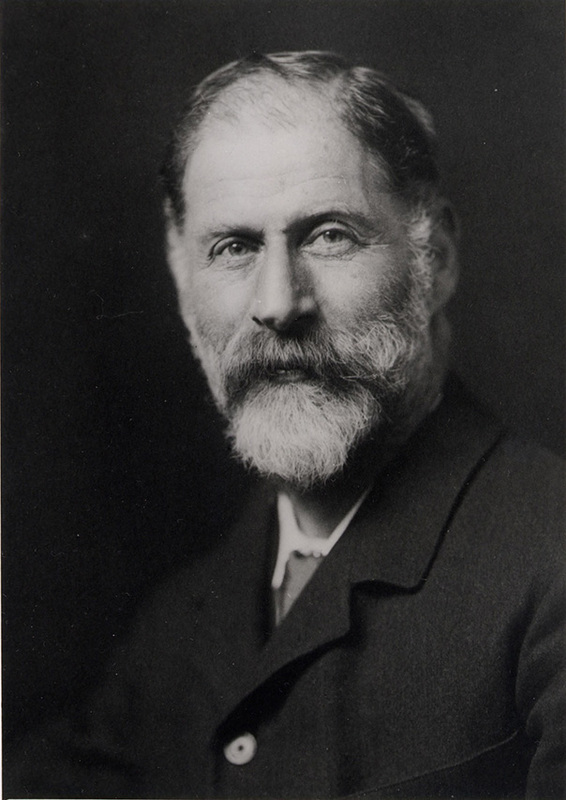 In 1844, National Trust founder Robert Hunter was born at number 13. In contrast, the Richardsons, the infamous 1960s gangsters, operated from no. 33, occasionally with a live bear! The square forms part of the earliest housing to be developed in the park area, dating from the beginning of the 19th century. The square was laid out some time between 1800 and 1810, and plots were taken and built on peicemeal, with no more than 5 houses being designed together. The fourth, northern, side of the square was home to one of south London’s first swimming baths, which opened in 1820. Another outdoor pool opened a few years later, also on the canal bank, behind the houses on the east side of the square. 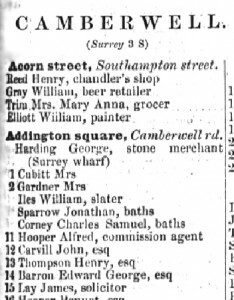 The first houses to be built, when the fields of Bethwin’s farm (commemorated in Bethwin St, across Camberwell Rd) gave way to Addington Square, were numbers 47 and 48, in 1810 – first owned by Nathaniel Simmonds, engineer for the canal. Next were 6 & 7 across the road and 17 & 18 on the south side in 1811. 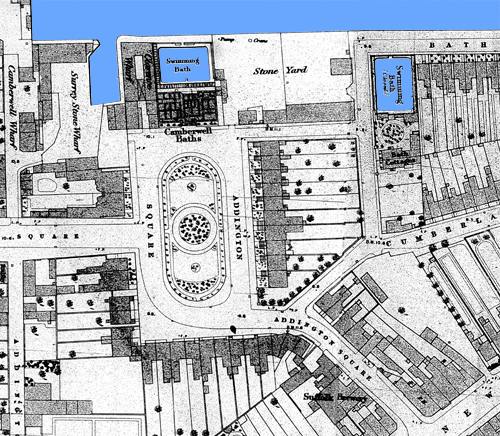 The rest of the square developed in small groups of houses, and was completed with numbers 38-42 in 1850. On the other side of the swimming baths to the north, the canal came to a halt in 1811 on its never-completed journey to Portsmouth. Wharves were built to unload barges here before they turned round to make the 3 mile journey back to the docks at Rotherhithe. The arrival of the canal, just as the square began to be developed, influenced the way it was built. The canal gradually brought more industry and the need for workers’ housing, so the grand designs of the first houses soon gave way to smaller buildings, with wharves and a stone yard jostling for frontage onto the square on the north, either side of the swimming baths. The swimming baths, on the north side of the square, was in use for 80 years, run by only three owners. However, by the end of the 19th century, the facilities were probably looking limited compared with the modern indoor municipal pools which had recently opened in Camberwell and Walworth, so after a brief stint as a laundry, Camberwell Council demolished the building to make way for a refuse depot in 1901. The Square is famous for two families. The aforementioned Robert Hunter was born in number 13 in 1844. 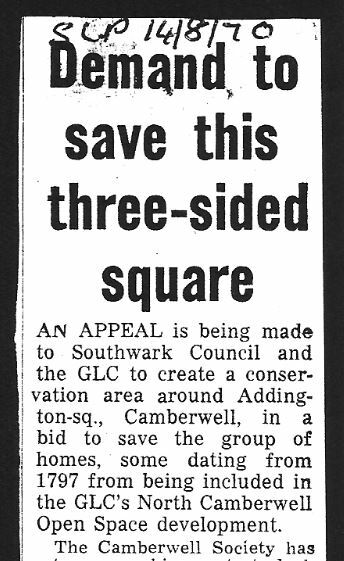 He became a dedicated campaigner for open spaces, helping to preserve many areas of common land in England. As a talented legal mind, he is famous for founding the National Trust with Octavia Hill and Rev. Hardwick Rawnsley. It’s highly appropriate that Burgess Park lives as a testimony to his work for the open space movement, but sad that there is still no Blue Plaque to commemorate him. The grand life of the square gradually declined at the end of the 19th and first half of the 20th century. Censuses show the number of live-in servants reducing and the numbers of occupants of each house increasing. Each house began to be occupied by multiple households. 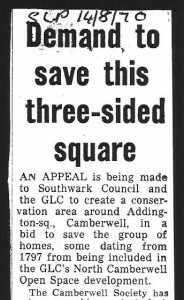 By the 1970s, the square was in a poor state, and the GLC proposed to demolish it to include with the land for Burgess Park. At the peak of the decline, in the 1960s, South London gangsters the Richardson brothers, Charlie and Eddie, established Peckford scrap merchants in nearby New Church Road, and a base in the square, at number 33. They later spent a lot of time in gaol, and their exploits have been documented in books, films and an art show in the square. They were said to have borrowed a live bear for a stunt to sell stolen toys from number 33! The council refuse depot on the north side later formed the basis of the first piece of recreational land in the area, which was eventually to become Burgess Park. 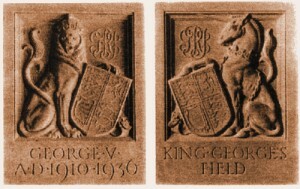 King George’s Field, just 1¼ acres, was established in 1938, with tennis courts and a children’s playground. 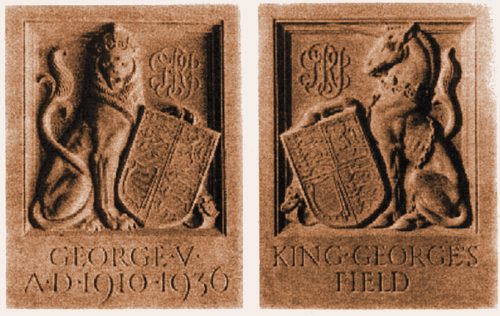 471 such public fields up and down the land collectively made up King George V’s memorial. Look for the plaques on the gate posts between the park and the square. Watch the Goldfrapp video shot in the square in 2009 here! What an interesting page – such an oasis amidst all of the ‘noise’ on the internet. My walks through Addington square will never be quite the same again !